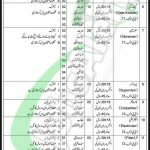 Tap to this page and get COD Rawalpindi Jobs 2019 Pakistan Army for Storeman Latest. If you are looking to have a job in Pakistan Army related department then it is the best place to apply such as Central Ordnance Depot COD Rawalpindi working Pak Army and currently, it requires the services of (Assistant, Data Entry Operator, UDC, Civilian Workshop Supervisor, LDC, GateKeeper, Storeman, Supervisor, Carpenter, Electrician, Fitter, Metal Worker, Painter, Welder, Tailor, Cook, Searcher, USM). For this purpose, it invites applications from the residents of Punjab, Balochistan, Sindh, KPK, FATA/Gilgit-Baltistan and Rawalpindi who are well-educated, very experienced, hardworking and well disciplined who possess following qualification and other skills mentioned in the following image posted below. According to the criteria candidates willing to apply should have age 18 to 30 years and those who are retired from any force should have maximum age 45 years and have at least Bachelors/FA/Matriculation/Middle/Primary degree with relevant diplomas from reputed institutes of Pakistan. So, viewers if you are just Matric pass and looking to have a job in any Government Department then apply confidently for the vacant post and apply as soon as possible as per the following how to apply procedure given below.